The Beecroft Institute for Particle Astrophysics and Cosmology (BIPAC) was established in 2003 with the support of the Beecroft Charitable Trust. It sits within the Denys Wilkinson Building, one of the sites of the Department of Physics at the University of Oxford. The aim of the centre is to be a hub of research in theoretical astrophysics and physics, focusing on the origin and evolution of the universe, the formation of large scale structure, dark energy, dark matter and the theory of gravitation. It promotes a synergy between analytic and numerical efforts to tackle the big questions in modern cosmology and facilitates collaborations with many of the cutting-edge observational and experimental programmes being developed at Oxford.The BIPAC director is Professor Pedro G. Ferreira. Oxford Physics has a strong programme of research in the “dark sector” of the universe. Researchers in the Beecroft Institute work on many of the key topics in this field. We are among the world leaders in high resolution numerical simulations of galaxy formation and have been at the forefront of proposing models of dark matter and dark energy and methods for detecting them. We lead the way in testing alternative theories of gravity and are extremely active in the theory and observation of large scale structure, using relic radiation left over from the Big Bang, surveys of galaxies and quasars, measurements of gravitational lensing and distant supernovae. BIPAC is a centre of activity in the Physics Department, hosting around 50 seminars each academic year and over 30 visitors using its facilities. 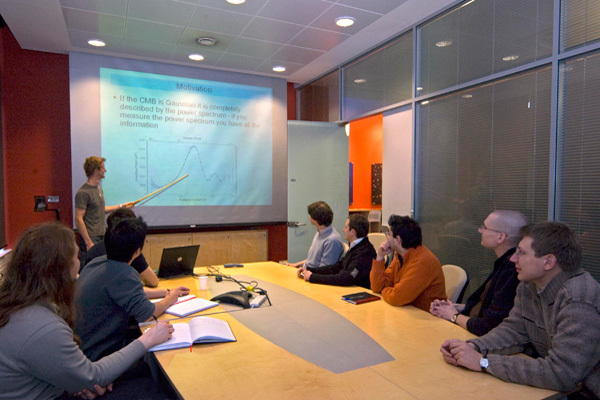 It hosts most of the journal clubs and group meetings of the Astrophysics subdepartment and is a prime location for many of the special events organized in Physics and Astrophysics. P Ade, J Aguirre, Z Ahmed et al. WC Keel, VN Bennert, A Pancoast et al. DS Aguado, R Ahumada, A Almeida et al. C Georgiou, H Johnston, H Hoekstra et al. A Witzemann, D Alonso, J Fonseca et al. A Mahabal, U Rebbapragada, R Walters et al. H Spiers, A Swanson, L Fortson et al. CS Lorenz, L Funcke, E Calabrese et al. K Kraljic, C Pichon, Y Dubois et al. M Walmsley, AMN Ferguson, RG Mann et al. Z Ivezic, SM Kahn, JA Tyson et al. H Katz, N Laporte, RS Ellis et al. J Cox, EY Oh, B Simmons et al. AD Feinstein, JE Schlieder, JH Livingston et al. S Codis, A Jindal, NE Chisari et al. JT Ward, D Alonso, J Errard et al. Time-lapse imagery and volunteer classifications from the Zooniverse Penguin Watch project. FM Jones, C Allen, C Arteta et al. L Fu, D Liu, M Radovich et al. D Liu, L Fu, X Liu et al. S Martin-Alvarez, J Devriendt, A Slyz et al. A Suzuki, PAR Ade, Y Akiba et al. T Hasebe, S Kashima, PAR Ade et al. RJ Smethurst, KL Masters, CJ Lintott et al. SJ Kruk, CJ Lintott, SP Bamford et al. JL Christiansen, IJM Crossfield, G Barentsen et al. C Uhlemann, M Feix, S Codis et al. TJ Turner, JN Reeves, V Braito et al. TS Boyajian, R Alonso, A Ammerman et al. A Amon, C Blake, C Heymans et al. H Dickinson, L Fortson, C Lintott et al. R Asquith, FR Pearce, O Almaini et al. A Spacek, MLA Richardson, E Scannapieco et al. J Harnois-Déraps, A Amon, A Choi et al. M Bilicki, H Hoekstra, MJI Brown et al. G Martin, S Kaviraj, JEG Devriendt et al.